Several Advents ago, a child at the Methodist Home got in trouble, according to a story told by our District Superintendent, Rick Lanford. His punishment was to put out the yard nativity set, putting all the elements in their proper place: the wise men, the shepherds, Mary and Joseph, and, of course, baby Jesus. Can you imagine if you’d never heard the story of the birth of Jesus before? I can’t remember a time that I didn’t know this story. As we approach another Christmas Eve in a long line of Christmas Eve’s we’ve celebrated, tune your ears to hear the story afresh and anew. Notice, as you listen, that there’s no mention of barnyard animals, even though every nativity set includes oxen. Notice that Luke doesn’t tell us that the birth was at night, even though every depiction of the birth story has Jesus born at night. No, Luke only tells us that the shepherds were watching their flock at night when the angels appeared. Notice, too, that there’s no mention of angels being at the manger; they’re only with the shepherds. Have you ever come home, opened the door, and stepped into a puddle? I had that experience several years ago. Through the backdoor I walked, stepping foot into a giant puddle throughout our kitchen. I looked around, figuring that the dishwasher or the sink was leaking, but they were fine. I thought maybe a pipe had burst in the crawl space, but then why would water have gone up into the house? No, that wasn’t it. I thought maybe the refrigerator had a problem but, no, that was ok too. Then I walked into our half bath and found the problem. The toilet had overflowed, a lot. Now, in case you’re worried, it was just toilet water, thankfully, but still I had a major problem. The water was sitting on top of hardwood floors. Parts of the baseboards were already showing signs of absorption. Dana ran quickly to get towels to clean it up. For Mary and Joseph, life was messy that first Christmas. We don’t tend to think of it that way because Luke presents the story in an orderly fashion and, indeed, just about every modern depiction of the nativity story I can think of gives us an orderly account. That account goes this way: they traveled from Nazareth to Bethlehem because of the census. A bunch of other people had, too, so there was no room for them at the inn. They found a manger and Jesus was born there. Angels showed up to some shepherds who then went to see Jesus. Everybody praises God and then goes home. Those are the facts of the story, laid out in an orderly fashion by Luke. And they’re just about the only facts we have. Mark and John tell us nothing about the birth; Matthew only adds to the story that wise men came and visited Jesus about two years after the birth! So, at the manger are shepherds, Joseph and Mary, probably a donkey and some sheep but no wise men, no oxen, and no angels. Just some simple, everyday, ordinary, humans, one of whom just gave birth. A very different, subdued, understated, scene than we’re used to. This subdued scene, one that we tend to think of as orderly, is actually really messy. The emperor, probably the most powerful man the world has ever known who rules over the most powerful empire the world has ever known, decides that it’s time for a census, something he can do now that he controls Palestine. Augustus had deposed King Herod’s successor. For years, the Jews had a level of political autonomy under their own governor, the most famous of whom was King Herod. Augustus, in deposing Herod’s son, installs his own man, Quirinius, to be governor, oppressing the people with Roman law. Their way of life feels under threat as Augustus, through Quirinius, moves to seize power away from the Jews. The politics of the moment of Jesus’s birth is a mess. And the census Augustus declares is its own form of a mess. The emperor has two purposes for this census. First, to count the people to correctly apportion taxes. More than likely, Joseph’s taxes are about to go up. Second, to count the number of young, able-bodied men who can be forcefully conscripted into military service. Joseph is likely about the be counted as one who could serve in a Roman legion. For Mary, who’s engaged to Joseph and pregnant with what people assume to be Joseph’s son, this had to be disconcerting. Joseph wasn’t rich; he probably barely eked out an existence as a simple carpenter, so they wouldn’t have been able to easily afford a tax hike. And then imagine Mary’s worry, fear even, that Joseph would be pressed into military service. This census threatens their lives with a mess. But they have no choice but to comply with the census. So, they dutifully return to Bethlehem, the ancestral town of Joseph, to record themselves as required. This trip was no joke. If you’ve been nine-months pregnant, imagine riding on a donkey along a bumpy road for miles on end. Traveling back then was hard, it was fraught with dangers of being robbed while alone, it was dirty as the dust kicked up on you and everything you owned; traveling was a nightmare. Traveling was a mess. But they travel and, when they reach Jerusalem, they’re tired, they’re weary, they’re worn, they’re exhausted and ready to rest. But there’s no rest for them. Luke says simply, “there was no room at the inn,” but undoubtedly Bethlehem had more than one Hampton inn. They searched all the Hilton properties, all the Marriott properties, they lowered their standards and searched the super 8s and motel 6s, but there was no room anywhere. All they could find was a manger, perhaps a cave on the outskirts of town, perhaps a barn, but regardless, a place where animals were fed and stored. That was the best they could do. Lodging was a mess. At Jesus’s birth, then, politics is a mess. The census threatens their lives with a mess. Traveling is a mess. Lodging is a mess. The manger is a mess. Everything about Jesus’s birth is a mess. An absolute mess. Today, we might be tempted to echo his sentiments, for we see much reason to think that hate is strong. There are wars and rumors of wars, there’s much violence and destruction around the world, just as there’s been in years past. And each Christmas, we say peace on earth, good will to men, while the world remains a violent mess. Life, indeed, is a mess, but we need not look to geopolitics to get proof of Longfellow’s words. In our own lives, we know that “hate is strong and mocks the song of peace on earth, goodwill to men.” We can count the messes we know personally. For some of us, our health is a mess, something we’re actively managing, trying to create order, trying to bring it into line, but so often, bringing order to our health seems illusive. Rather, healthcare, whether the system or simply trying to keep ourselves healthy, is a mess. For some of us, our finances are a mess, something we try to hide and manage ourselves. We’re intent on keeping up appearances, buying things we shouldn’t, doing things we shouldn’t, so that we can keep up appearances. But, the reality remains, our finances are a mess. For some of us, our families are a mess. We have relatives who seem to exemplify that “hate is strong,” or others who simply cost us small fortunes. We also have relatives who worry us constantly, or who keep making the same wrong choices. Even though we might could use help, we keep all this private, lest others realize what a mess we’re in. For some of us, we’re a mess on the inside, just trying to keep it all together. Old insecurities arise, our emotions seem to control us rather than the reverse, and we struggle to keep up a happy face and appearance. We try to keep private our internal turmoil, lest others realize what a mess we are. Life is a mess, and while we try to hide it, while we try and act like it’s not there, while we try and fix it ourselves, if we’re honest this evening, we know that our lives are messy. There’s much reason to say with Longfellow, “and in despair I bowed my head, there is no peace on earth, I said,” for how many of us can honestly say this Christmas that we know peace throughout our lives? We think of the birth story as orderly, but it’s clear that it was a mess in many ways. Jesus was born into a chaotic, smelly, impolite, politically unstable, mess. And this was not by accident. God could have chosen to send Jesus at any time in the history of the world. It could have been at a much more orderly time, it could have been in a much more orderly way. God could have rolled out the red carpet, wrapped the baby in the finest of cloths, announced to the literal entire world with all the heavenly hosts the arrival of the child, and brought the rulers of the world to his palace to see the new god-king. 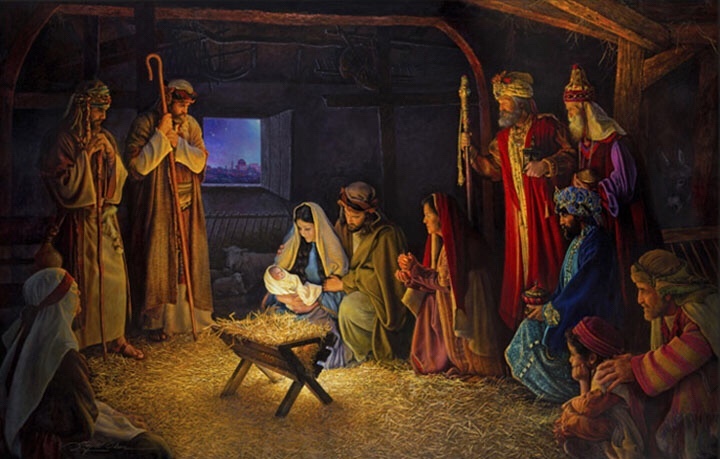 God could have made Jesus’s birth the most orderly, beautiful, pleasant, polite, stable, birth imaginable. But Jesus was born into that chaotic, smelly, impolite, politically unstable, mess, because God had a message to send to the world for all time and to us on this Christmas Eve: I want to be a part of your mess. Life is messy, but God sent Jesus to enter into our messes. If there’s anything clear about the birth story, it’s this: Jesus came into the world to be with us, to be among us, to be Immanuel. God came down from on high to enter into our story, into our lives, into our mess. Life for Jesus was always messy. His three years of ministry were full of messy encounters, troubled relationships, deceit and questioning, defamation and eventually trial, betrayal, and execution. Nothing about Jesus’s earthly existence was nice and pretty and neat. It was a mess. Life for Jesus was a mess. And so Jesus knows what it is to be in the midst of our messes. Were we to have the bravery to admit it, we would discover that all of us in this room have messes in our lives. I have messes in my life! We are all living in the midst of this very messy thing we call life. And no matter how messy our lives, no matter how messy our finances or our health or our families or our relationships, God wants to be a part of our mess because God wants to be a part of every aspect of our lives, even the messiest of parts. So on this Christmas Eve, give God a gift: give God your messes. The power of Longfellow’s poetry comes through in his honesty. He’s not afraid to tell God that this declaration, year after year, of peace on earth, good will to men, feels like a lie. Hate seems to be winning, mocking what God sent Jesus to do on earth. Longfellow gives God the gift of his messes by being emotionally honest with God. Longfellow found his way out of his mess only because he was honest, open, and forthright about his mess. That’s what, on this Christmas Eve, it means to give God our messes. For God’s love, born in a manger so long ago, came to the world to redeem our messes. That’s the promise of the Christmas season: that God came into our mess to clean it up by offering us redemption from our sins and from the ways evil causes messes in our lives and in our world. God sent Jesus to be light. That means the darkness of our messes cannot overcome us. That’s the promise of the candles we’ll hold later in this service: the light has come, redeeming our messes. But that redemption comes at a cost: we have to be honest with God about the messes we have. We have to stop trying to control and fix those messes ourselves; we must admit to God that we need help. If we’re to let the light of Christ in, we must let that light shine on the messes we have, revealing them to God. That light can heal our messes, make us whole, but we have to open ourselves up in prayer, be vulnerable, be emotionally honest, to let the light in. An emotionally honest prayer life is a prayer life that brings healing to our messes. In the name of the Father, and of the Son, and of the Holy Spirit; Amen.